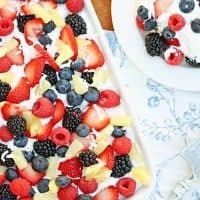 FRUIT AND PUDDING CAKE — A yellow cake layer is topped with fresh fruit, a sweetened vanilla pudding and cream cheese layer, whipped cream and coconut in this delicious summer cake. This Fruit and Pudding Cake is hands down my family’s favorite cake. I actually can’t believe I haven’t shared it with you already, since my husband and boys request it so often. I especially love making this cake during the summer months, when so much fresh fruit is in season. Looked very good so I fixed it for a gathering of friends. One couple brought their 14 year old daughter and I got an “Oh Wow!” from her when she tasted it. That started everyone lining up to try it. You can use any type of fruit you’d like to top this cake. One of my favorite combinations is pineapple, kiwi and strawberries. 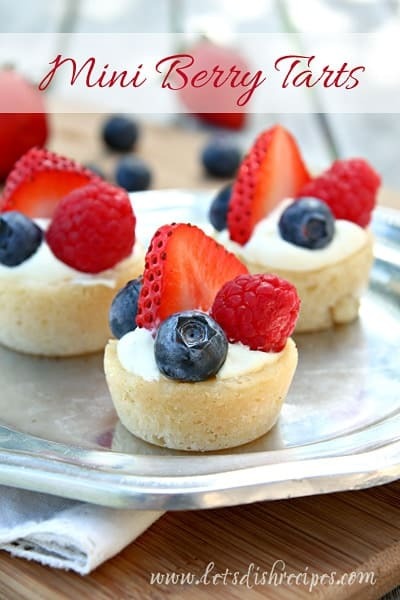 This berry version though is perfect for Memorial Day or Independence Day. I recommend using mostly fresh fruit. Any canned fruit you use should be very well drained. Pineapple and mandarin oranges are both good options for canned fruit in this recipe. The coconut is optional, but it does help keep any juices from the fruit from seeping into the whipped cream. Whether you use the coconut or not, I recommend adding your fruit just before serving, if at all possible. Don’t be surprised if you get lots of requests for this cake recipe. It’s different and refreshing and it’s a hit with everyone who tries it! Be sure to save this Fruit and Pudding Cake recipe to your favorite Pinterest board for later. A yellow cake layer is topped with fresh fruit, a sweetened vanilla pudding and cream cheese layer, whipped cream and coconut in this delicious summer cake. Preheat oven to 350 degrees. Spray a 9×13 inch baking pan with non-stick cooking spray. Mix 3/4 of the cake mix with the water and egg until well blended. Pour into the prepared pan and bake for 15-20 minutes; cool completely. Meanwhile, beat the cream cheese until light and fluffy. Gradually beat in the milk and mix until smooth. Stir in the instant vanilla pudding. Spread the pudding mixture evenly on the cooled cake. 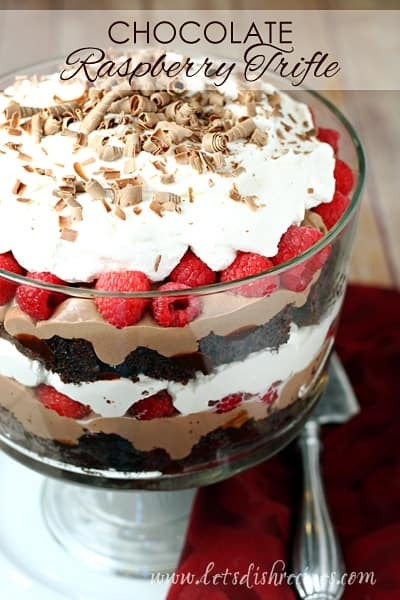 Top the pudding layer with the whipped topping. Sprinkle the coconut over the whipped cream layer. 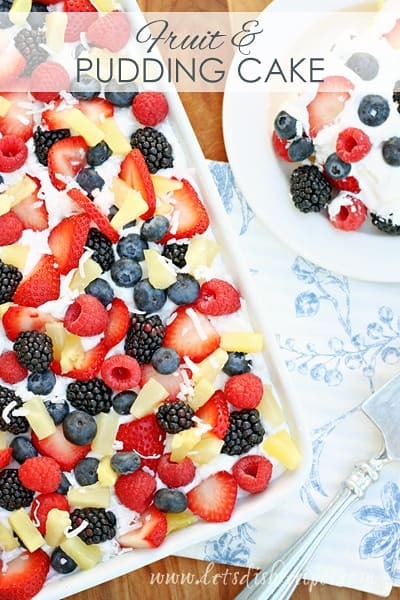 Top with the pineapple and berries. Who Dished It Up First: This recipe was given to me years ago by a friend. That looks so good and easy to make. Thanks for the recipe! 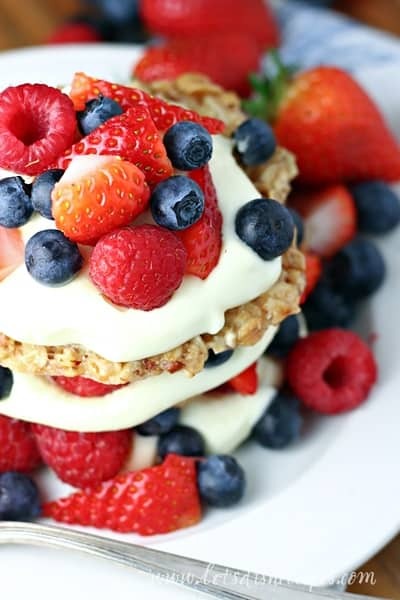 This looks delicious and refreshing with all of the fruit! Looked very good so I fixed it for a gathering of friends. One couple brought their 14 year old daughter and I got an “Oh Wow!” from her when she tasted it. That started everyone lining up to try it. Her mother said that if I got that reaction from the daughter it must be good!! Very good, easy to fix and all have loved it! Looks absolutely scrumptious and easy to make as well. I will try this recipe without a doubt. Probably for a social planned in early September!! Looks soooo refreshing! Why only 3/4 of cake mix??? what do you do with the other 1/4????? For cooks who love to bake often, it seems reasonable to save that unused 1/4 of the cake mix. It can be saved for an extra cake AFTER this recipe has been made another three times. Voila! Now you can make a fifth cake! It is important to include the expiration date found on the packaging with each unused portion on the outside of the small container. The reason for what may seem to be overcautious is simple. Read on . . .
Dry mixes do not have an unlimited shelf life. One of the common dry ingredients in most baking mix products can become lethal over time. Expiring mixes, e.g., cake, pancake, biscuit, etc., should be used before or shortly after the expiration date shown on the original packaging..
A couple of years or so ago, I read of a young man who had just returned home after a long absence. His loving mother, to please her son, prepared him a welcome-home breakfast of pancakes. Sadly, those pancakes cost him his life. An investigation revealed that the pancake mix the mother used had expired. After reading that, I went through my pantry and discarded several boxes of expired cake mix. Best to buy them only when you know they will be used rather than allow them to sit on a shelf until it’s too late. I now buy them on an as-needed basis. It is also wise to go through the pantry and look at the expiration dates on both baking powder and baking soda. If they are expired, discard them and buy smaller containers to avoid using an expired product sitting there until it/they expire. I hope that by writing this, I have provided someone with valuable information. What is the reason for only using 3/4 of a cake mix? Why can you not use the whole one rather than waste it? Pat asked that question in 2016. Jean also asked that question in 2017. I am asking the same question as I never saw a response. You are welcome to use the entire cake mix if you would like, but you would need to adjust the quantities of egg and water to get the desired result. The cake mix is simply a shortcut to creating a thick, dense, cake-like “crust” for this recipe. You will notice that you don’t mix it up as you would a traditional cake, for example, you don’t use any oil. It’s not meant to be a traditional cake, but a base for the pudding/whipped cream/fruit layers. If you want a traditional cake, or can’t bear to throw away 1/4 of a cake mix, then disregard the recipe and simply follow the instructions on the cake mix box for preparing the cake.